Top: giant event template that was populated during the program by all 150 participants with strategic insights. Middle: one of over 20 breakout groups. Bottom: Participants were from the Skype office in Palo Alto, CA. The event was conducted at the San Francisco Zoo. Skype is a global division of Microsoft specializing in internet telephony. 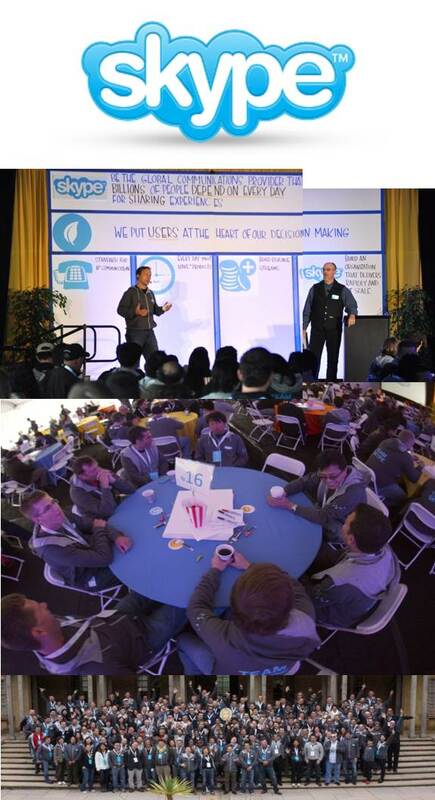 Leadership improvement and greater cohesion in Palo Alto office, smoother integration of Skype into Microsoft. One-day event to engage with corporate leaders and a new vision.